The Warrant number 13 was issued to 'Antient Union Lodge' in Limerick, on the 22nd November 1732. However, this date only coincides with a time when records began so it may have been in existence for some time before that. Lodge 13 are the proud possessors of an old brass square that was found under the foundations of Baal's Bridge in 1830. This Square, dated 1507, is reputed to be one of the earliest Masonic items in the world. Click here for more information on the Baal's Bridge Square. Lodge 13 suffered many ups and down in its Masonic history, but was fortunate enough that its Warrant was never surrendered, suspended or cancelled. Unfortunately the Lodge records from 1732 to 1793 have not survived. However, from 1793 onwards the records are preserved in the archives of The Grand Lodge of Ireland. The Lodge went through a period of two years (1808-1810), when meetings were not held. It was revived in 1810 by a Bro Francis Wheeler, who was installed as Master that year. W. Bro. Wheeler got things on an even keel for a few years, generally improving attendances at meetings. Sadly a second quiet period occurred between the 24th June 1816 and July 1819, when no transactions were recorded. However, a further revival took place and the Brethren met, elected new Officers, re-establishing the Lodge for future meetings. Tyler of 271 with Sword and Insignia. The Band of the County Limerick Militia. Junior Brethren two and two. Senior Brethren two and two. Two Brethren, carrying the Holy Bible, covered with black crepe. The Master of 271, and Past Master. The Tyler of Waterloo Lodge (of the 79th Regiment) No 233 on the Registry of England. Two Deacons, bearing staves, with doves covered with black crepe. Band of the 79th Regt with Drums muffled. Two Wardens with truncheons covered in black crepe. Visiting Brethren from Royal Artillery, two and two. The Holy Bible, borne on a crimson cushion by two Brethren with insignia. The Master of the Lodge and Past Master. The Band of the City of Limerick Regiment, with muffled drums, covered with black crepe. Visiting Brethren two and two in mourning. The Members of No 13 two and two in mourning. borne by two Brethren and covered with crepe. with rich scarlet cloak, and in deep mourning. Four women, clad in white linen. Two Medical Gentlemen, in scarves and cypresses. The Chaplain of Lodge 13 in full costume. friends of the deceased, in mourning. Clearly this must have been a most solemn and impressive occasion. Grand Lodge Laws and Constitutions, right up to the year 1850 included the order of procession and the exact form of wording to be used at Masonic funerals, as an integral part of its content. It would be many years thereafter before the tradition of a Masonic burial would finally cease. Another extensive Masonic funeral took place in Limerick on 19th February 1867. 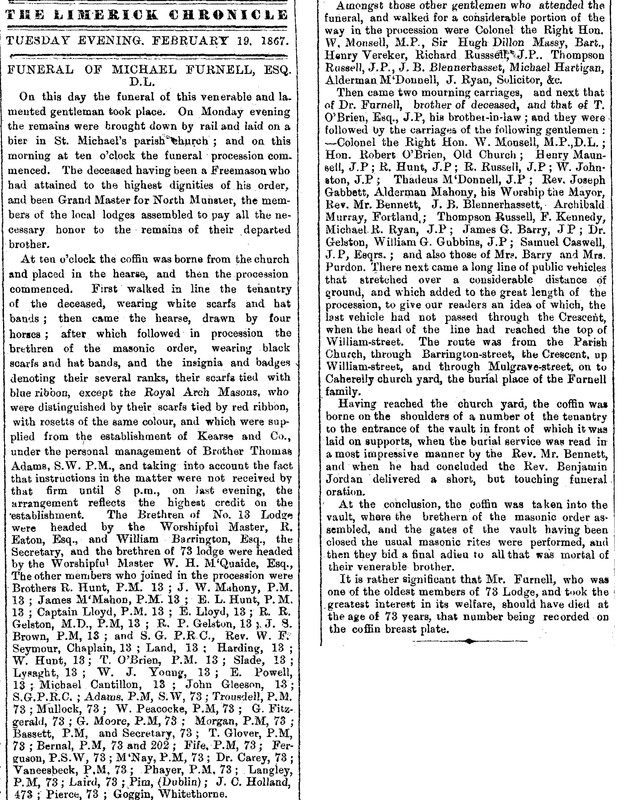 This time it was the funeral of the late Michael Furnell, D.L., who had been the first Provincial Grand Master of North Munster, when it was formed in 1842. He was responsible for the revival of Lodge 13 in 1840 after it had not met for a few years. He retired as Provincial Grand Master in 1863 and went to live in Dublin, but did not sever his connections with the Province, calling his house in Sandymount, 'North Munster'. The following report of his funeral appeared in the local Limerick Chronicle. On the 5th December 1820, the Lodge Members of Antient Union No 13 passed a motion that the "Best thanks of this Lodge be presented, along with a gold medal to W. Bro Christopher Marratt, Mayor of this city, for the excellent manner in which he discharged his duties as W.M. of this Lodge". Interestingly enough it was the very next year that we find record of a solid silver snuff box amongst the possessions of the Lodge (donated by an un-named benefactor). This snuff box is still used today at special festive gatherings together with the Mariencourt Cup. The snuff box was made by Richard Sawyer of Dublin and bears the hallmark for 1809.